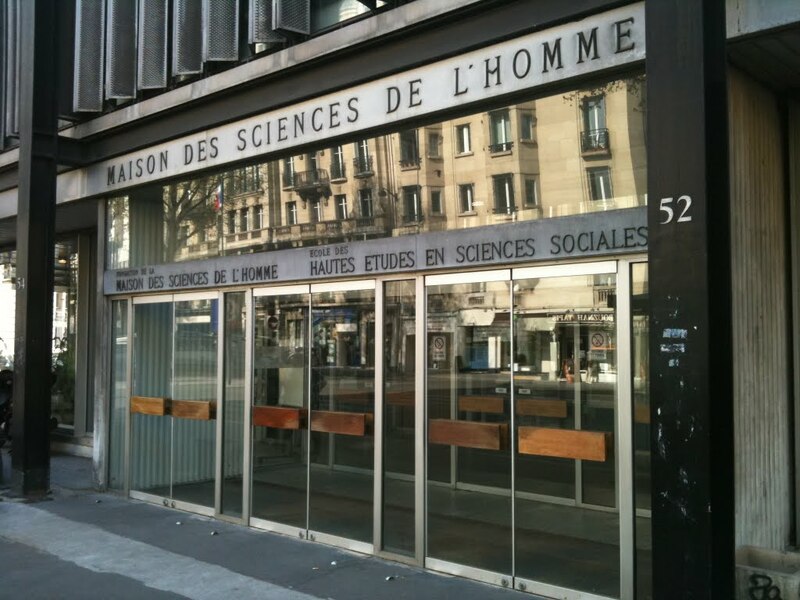 Founded in 1975, the École des Hautes Études en Sciences Sociales grew out of the 6th section (Social Sciences) of the École Pratique des Hautes Études, a section which was created in 1945 by Fernand Braudel and Lucien Febvre and which became autonomous. EHESS plays a distinctive role in the landscape of French teaching and research. It is not a university, but it teaches master and doctoral students in all areas of human and social sciences (history, anthropology, sociology, economics, geography, linguistics, psychology and linguistics, demographics, cognitive sciences, political science, philosophy and mathematics). With its 47 research centres, EHESS is dedicated to research training and offers a very wide range of research seminars. It is also involved in numerous scientific programmes which encourage interdisciplinary and transversal reflection and methods. This conception of research has led the School to give pride of place to cultural spaces on site and to actively promote interlocution between social sciences and other sciences (life sciences in particular). The School has 300 teacher-researchers, 500 researchers in its research centres, 450 engineers and technicians and 3100 students of which 1100 are studying for master’s degrees. EHESS also has a strong international vocation: it is involved in an Erasmus Mundus Phoenix master’s programme, a Franco-German master’s programme and doctoral college and a European doctorate in history, sociology, anthropology and the philosophy of European legal cultures. Each year it welcomes lecturers from all over the world and half of its students also come from abroad. Its capacity to accommodate and teach doctoral and post-doctoral students, and the significant number of published EHESS researchers make it one of the leading poles of social science research in Europe. In Paris, TEMA+ EMJMD is attached to the “Territoires, espaces, societies” (TES) master’s programme which was set up at EHESS in 2005. The “Territoires, espaces, societies” master’s specialisation is based on the fact that towns and territories raise vital and ever changing issues for researchers. The development of new public policies for towns and rural areas within the framework of town and country planning, the acute nature of urban and environmental management and the administrative and territorial reorganisation required by European integration challenge established research in social sciences and provide material for renewed reflection. The teaching is part of an intellectual tradition which takes into consideration the interaction between space and time. This school of thought is well represented at EHESS through the history of space and geography, acknowledging social science’s new sensitivity to space, now considered to be one of the main dimensions of research: identity and belonging, production and markets, migrations and social networks, norms and institutions, territorial planning and actions – all of these phenomena have a spatial dimension which is deemed to be essential to their analysis. For the TES specialisation, space is not evoked in a purely metaphorical manner, but as the framework and result of action. It is studied as the complex product of powers and practices, of development and representations, and EHESS wishes to analyse the many forms of intersection between social logics, materiality and know-how. The specialisation is thus thematic and is based upon a multi-disciplinary approach, upon an open-mindedness towards comparatism and upon the variation of scales of analysis. Space is a subject shared by various social sciences, within which it has often led to the creation of disciplinary branches. The town, for example, appears in “urban” history, geography, sociology and anthropology, not to mention the contribution made by urbanism and architecture. Above and beyond the richness that these different fields have brought to their respective disciplines, it would now seem useful to bring to this break-up or to this confinement of the object within individual fields of specialisation, the counterpoint of a cross-reading which calls upon the issues and tools of the different disciplines concerned. This specialisation is open to students from all disciplines and is a resolutely heterogeneous course. Teaching is provided by a team of historians, geographers, sociologists, anthropologists and architects brought together over the years by a branch of specialist doctoral studies on towns, the rural world and territories and through research and jointly organised study days. This programme also includes a highly active workshop on computer-assisted cartography and on the Geographic Information System (GIS). With specialists from all cultural domains and from numerous international projects, EHESS aims to allow comparison and exchange between subjects encompassing different times and spaces and to open the way for the consideration of the specificities of the spatial and social configurations to be found throughout the world. The TES master’s programme now welcomes students from all over the world and benefits from the Erasmus mobility agreements which have been made with more than twenty European countries. The teaching programmes also aim to increase the number of scales of analysis. Reflection relates to all levels of spatial organisation: the micro-local scale of urban districts, rural identities, administrative networks, forms of state, transnational structures and empires. It also demonstrates the methodological utility of analyses based on interaction between these scales. After completing the TEMA+ curriculum, students can continue their studies within the framework of EHESS’ social science doctorate “Territoires, sociétés, développement” (TSD).